Students interested in attending criminal justice schools in Hawaii can choose to work in many legal and protective service fields after graduation, in large cities and local communities across the state. From police work on the streets and laboratory testing for forensics to work in various courts of law or even parks and environmental protection, criminal justice students can work in a variety of landscapes, from major cities like Honolulu to rural areas like Lanai. Hawaii's criminal justice programs help students pick the area of this broad field that will best suit their interests and career goals. Read on to learn about the different programs and job opportunities available in criminal justice in Hawaii. After Criminal Justice School in Hawaii: What's Next? A criminal justice program's cost, graduation rate and student-to-teacher ratios are all factors that can help determine the best school to attend. 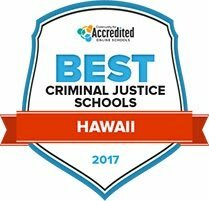 This list provides a breakdown of the best criminal justice schools in Hawaii, taking into account these major contributing factors and more. In comparing the top criminal justice schools in Hawaii for 2016, students can see excellent examples of what to look for in a program. The college's administration of justice program is an open-door program that prepares graduates for entry into law enforcement, private security, courts and corrections. Program standards include critical thinking, sensory and observation skills, communication skills, motor skills, environmental tolerance and behavioral skills. Student services include degree planning and graduation scheduling, advising and academic counseling, student media board, student life and development services, career services and on-campus employment. Students will be able to take advantage of other services and resources in the library, the bookstore and the Hawaiian Center. The campus also maintains a wellness center and a health office. Hawaii Community College offers an administration of justice program, which is designed to prepare students for careers in the field of criminal justice. The program immerses students in three different systems: courts, corrections and law enforcement. Upon completion, students will be prepared to enter the workforce in a variety of fields, or they can apply their degree to a four-year program. Student services include computer services and learning resources, such as the Transfer Success Center, the Mookini Library and an advancement and testing center. Counseling and advising is available to all students through the Support Services Center. Chaminade University of Honolulu offers a bachelor's degree in criminology and criminal justice to encourage students to examine the American justice system. Students who want to enhance their understanding of the criminal justice system can continue their education with a master's degree in criminal justice from the university. The financial aid office on campus is available to help students manage and understand loans, scholarships, and budgeting. The university offers 24/7 security, as well as an on-campus health and wellness center to help students maintain physical and mental health. Tutoring services include in person by appointment and online tutoring through Smarthinking. Through the bachelor's in criminal justice program at Hawaii Pacific University, students will be exposed to all areas of criminal justice and prepare themselves for a career in the field. They can also get involved on campus by joining the Criminal Justice and Justice Administration Club. First year students can participate in programs designed specifically for them to become comfortable on campus and develop skills and friendships. Tutoring services are available to students online and in person in all subjects. The university also provides health and counseling services to students to ensure they stay healthy. At the Honolulu Campus of Remington College, students can pursue a bachelor's degree in criminal justice and prepare themselves for jobs in the field at the local, state, and federal levels. Students can also pursue the degree entirely online if they are looking for a more flexible schedule that fits with their lifestyle. Career service representatives are available on campus to help students transition from college to career. The Remington College financial aid office is available to help students find the best way for them to afford a college education. Students at the University of Hawaii in Hilo who pursue a bachelor's degree in criminal justice will be prepared to enter careers like law enforcement, corrections, and probations. All new students can participate in programs designed specifically for them to be successful in their new community. Tutoring is available to all students to help with course work, and to become self-motivated, independent learners. Career development services are also available for students to get feedback on resumes, and individual career advising. To make sure that students are healthy, the university provides on-campus health and counseling services. When narrowing down the best educational options, students should also be researching the specialization each school offers. This helpful search tool provides a list of accredited criminal justice schools in Hawaii, so students can see more details about each specialization or focus of study offered by each program, along with other useful information like tuition, acceptance rates and financial aid availability. Hawaii has a range of employment opportunities and career paths for students planning to attend criminal justice school. Below are some common careers for professionals working in criminal justice field in Hawaii, with employment rates and salaries. Click the corner of each box to see these details, as well as what level of education is needed to pursue these careers in Hawaii specifically. Because of the unique economic and business landscape compared to other mainland states, students researching criminal justice schools in Hawaii may find it helpful to compare the job market on the islands to numbers from the rest of the nation. Hawaii employs wide range of criminal justice professionals, from the sheriff and police departments to conservation, fish and game wardens in the field to lawyers, court clerks and judges in the office. Scroll over the graphs below to compare the average salary of a criminal justice employee in Hawaii with the rest of the nation, see how job growth compares and learn what type of degree each career requires in Hawaii specifically. Though job growth projections are scattered for criminal justice school grads in Hawaii, there are some areas on the islands where criminal justice jobs are more concentrated than others. Though Hawaii was ranked 40th in terms of its total population by the 2015 Census, the state employs over 25,000 people in protective service and legal occupations. Scan the markers on the map below for more details on which islands and cities grads can explore after criminal justice school, and how wages vary by location. This statewide nonprofit offers members social and business networking opportunities as well as trainings and continuing education programs as they advocate for businesses in Hawaii. As a leader in Hawaii's business community, this group promotes a sustainable economic environment for businesses and seeks to provide meaningful jobs to the community. Members have access to educational resources, political and legislative action and various community building events. This government department provides business owners and consumers with information on state procedures, legislation, and protections. They also have licensing resources for vendors seeking to work with Hawaiian state and county entities. This website provides information about the current state of Hawaii's correctional system, from local jails and prisons to audit reports and population surveys. The Department of Public Safety also provides information on the Corrections Division's policy and procedures, as well as a job locating service. Nationally recognized for its success, Hawaii's Opportunity Probation with Enforcement (HOPE) program was launched to reduce probationary violations by offering high-intensity supervision and immediate sanctions that help deter recidivism. Information on HPA rules and guidelines, annual reports for the last three years, and pardon application and paroling handbook resources. A resource for court information, Ho'oiki criminal records searching, information on court procedures, forms and employment in the law field in Hawaii. Providing funding and technical assistance to many juvenile education and rehabilitation programs in Hawaii, this JJSAC site includes several statistics and reports, as well as information on current Council members and their roles in the criminal justice community. A collection of links to appellate and bankruptcy courts; Hawaii's district, state and local courts; laws and regulations; lawyer resources; state agencies and various departments that may assist with business law or other judicial system information within Hawaii. From online teaching guides to live event schedules, the King Kamehameha Judiciary History Center provides a legal history of the state and its groundbreaking legal cases. District court information for Hawaii, including forms, judges and rules to information for attorneys or those interested in self-representation. The ALCU of Hawaii is a local branch of the national civil liberties protection group. Stay up to date with news and blogs on current events and learn about local issues and how to get involved with local civil liberties cases here. Providing continuing legal education resources for lawyers and lawyer locating services for the public. A nonprofit, public interest law organization working to help low-income Hawaiians with legal and mediation services. They also work for immigrant justice and provide volunteer and job opportunities online. From preserving ancestral lands to protecting traditional and customary rights of native Hawaiians, the NHLC is the only non-profit law organization that concentrates specifically on providing legal assistance to indigenous families, communities and individuals. This website leads to the various legal and public service divisions within this office, including the task force for internet crimes and tax and charity information. An all-encompassing employment site for the Honolulu Police Department. Including both the Sheriff Division and the Narcotics Enforcement Division, this branch of Hawaii's Department of Public Safety works statewide to protect the public and provide law enforcement services. The website provides more information about these services as well as a job locating tool. The state's largest police union, SHOPO includes Honolulu, Hawaii County, Maui County and Kauai County Police. Their website is a compilation of information about each department chapter. A central agency serving the Attorney General, the CPJAD researches crime trends and provides education and crime prevention programs to at-risk communities in Hawaii. Information on services and job opportunities in this division, which seeks to enhance, conserve, and manage Hawaii's natural resources. They offer information about legislative proposals as well. A department dedicated to protecting, conserving, and managing Hawaii's natural, cultural, and historic resources. The site has information on the rules as well as education services and jobs. The National Park Service employs rangers and other people interested in conserving national parks, and there are employment opportunities in Hawaii's national parks such as the volcanos on Hilo.